It looks like our pal Norman Osborn is getting an upgrade via the Carnage symbiote. Would've preferred him on a new Fantastic Four book. Is he going to be on Tony or Riri or Doom? That said, yeah, I can't see him really fitting on any Iron-man book. Judging by the interview, looks like Stark. IIRC, when last we saw Stark his comatose body had mysteriously disappeared from its recovery pod. Yeah, his Spidey is a mixed bag for me but he's always seemed perfect for the F4. It's that one MadGoblin photocomic: " All for Norman! All for Norman! " 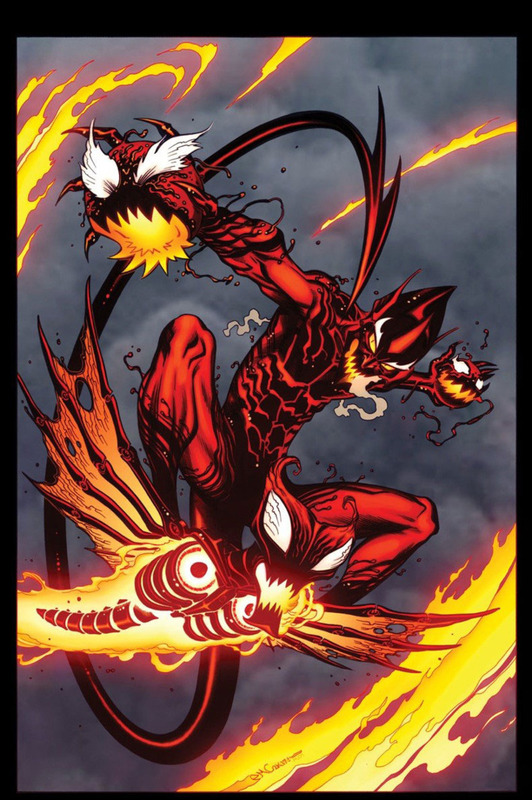 Shouldn't the symbiote be hurt by the heat and explosions from the Glider and Bomb? Shouldn't it be hurt by those eyebrows? I know I am. Maybe it's just a new glider Osborn made to match his new look, rather than one somehow made by the symbiote. IIRC, Carnage is now immune to fire. Dan Slott has a lot of fun with continuity. So he could do some good stuff with Iron Man history. That "Wong Chu was working for the Mandarin" retcon John Byrne did might be fun. Why is the Goblin Glider like that...oh he changed it to match. Is Nick Spencer going to be taking over Amazing Spider-Man once Slott leaves? I vaguely recall some announcement that he was going to be taking over a Spidey title in 2018. Pretty sure that was a rumor. Bleeding Cool keeps pushing that hard, but they also think Coates is going to write Captain America.